The summer I finished middle school 60 other kids and I got to watch a total solar eclipse at summer camp. Or not watch it I should maybe say, for fear of burning our retinas; The counselors were told to corral us all into the camp dining hall for the duration. This event took place on July 20th a hundred years ago as it now seems and it popped into my head on that same date this year – last Saturday in other words. The memory was so vivid: I saw the gravel road we walked along to get inside the dining hall; saw the wildflowers of high summer nodding in the breeze; saw again the big posters I was making in the camp’s little theatre where in two days time we would hold the big Team Party.. (I was Captain of the Gold Team and had talked the Captain of the Green team into making a huge production of the whole thing, painting oversize images of Warner Brothers and Disney cartoons on poster board. Back then my bangs kept flipping up like window shades; there was no stopping them. I didn’t look a thing like those teen movies stars with their long straight hair, and not in summer especially what with the twice-daily swimming periods you couldn’t get out of. Somehow it was OK though. There weren’t any mirrors to see yourself in anyway, save for a small cracked five by seven-inch one hanging on the wall of the washhouse. I can’t recall a single mirror in our little bunkhouse. “Bunkhouse”: sounds like where George and Lenny slept in Steinbeck’s Of Mice and Men and we lived kind of like that come to think of it. The camp wasn’t a bit fancy – no electricity in those cabins, and canvas shutters that you banged down fast when the rains came. We loved it though. Kids came back for years and years, for all eight weeks, unbelievable as that sounds nowadays. My sister and I were only there because our mom was the Camp Director, which was a good thing since being apart from her would have been impossible for us. Certainly it would have been too hard for me, even that year of the eclipse when I was 14 and finding myself newly dazzled every day by the light of a brand-new sun. 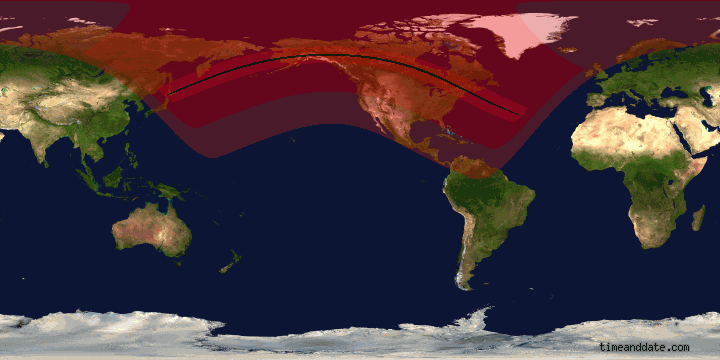 This is how the eclipse looked on that very long ago July 20th. What a find on the Internet! Maybe Faulkner was right and the past isn’t really past at all. 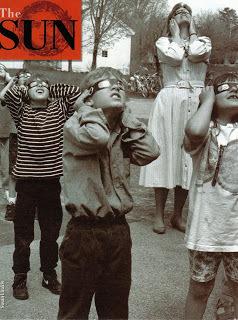 I remember making pinhole viewers with my children so they could watch the eclipse. Then we noticed the sun coming through the huge tree in our front yard made hundreds of tiny eclipse viewers all over our front walk. We felt like we’d won some kind of prize, an unexpected afternoon of magic. I was only there once but thought it a bit like heaven and was very envious of cousin Terry and Nan for getting to be there every summer. I used to dream of returning.